Thank you so much to Johnstone's Paint Company for sending me this gorgeous selection of Paints, Waxes and Metallics from their Revive Range to try out. I could waffle on and on about how wonderful they are but long story short I tried them and I love them. 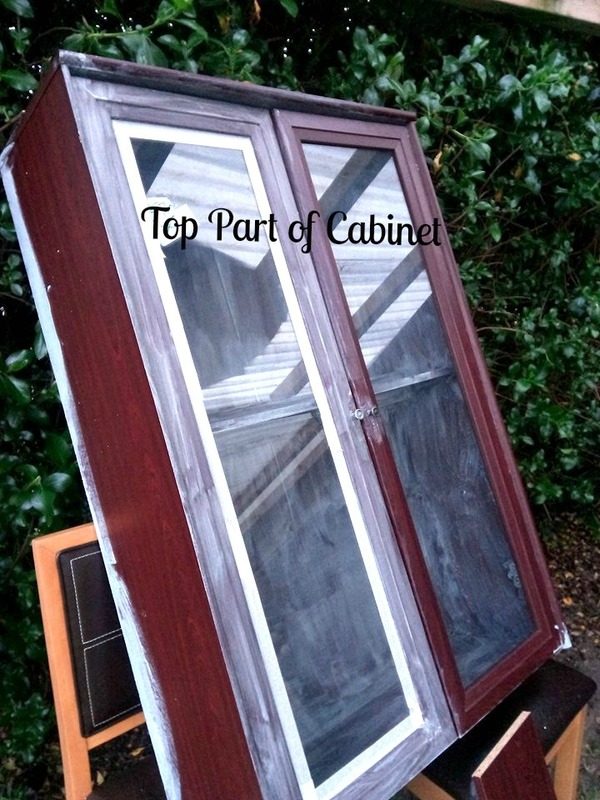 Really nice application, easy clean up and NO SANDING OR PRIMING NEEDED WITH THIS CHALKY PAINT!!! That's the part I love. 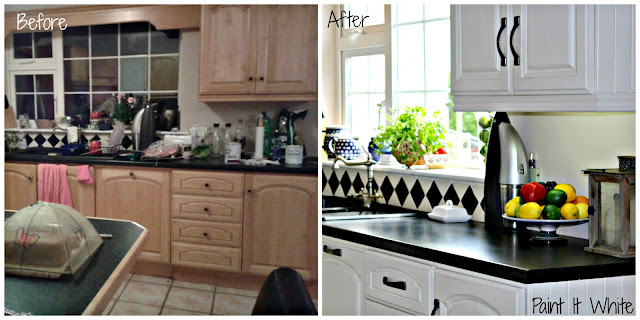 So here is the 'After' shot of my cabinet. Just scroll down to see a 'Before' shot. And here is the 'Before' .. I found the cabinet a few months back in the Clare Haven Charity Shop where I volunteer. (If you ever find yourself in Ennis, Co. Clare they are worth a visit . Endless up-cycling opportunities await you there with a few beautiful antiques thrown in!) It's made from laminate 'wood' but it's very sturdy and I just fell in love with those beautiful big glass doors. 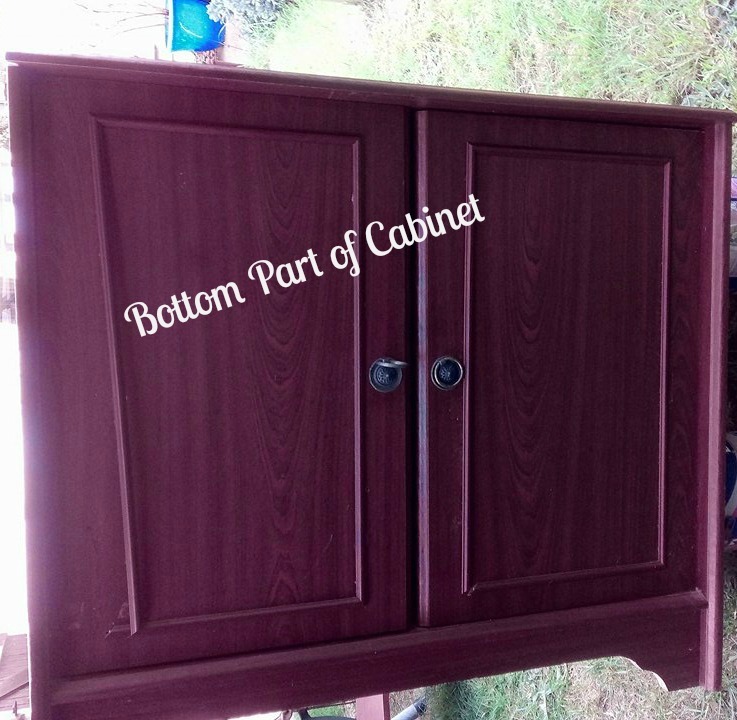 This is a two part cabinet so I was able to take it apart which made it easy to paint and so easy to move . I took the cabinet apart and started to paint it before I remembered to take a proper 'Before' shot so this shot above is all I have! Hopefully you can make it out! So for my part in the Johnstone's Do-Er's Campaign I wanted to show you how you can turn an old discarded piece of furniture into your own masterpiece with just a splash of paint and a huge dollop of your own imagination using the Johnstone's Revive Paint Range. It's simple to use and it's also water based so clean up is easy too. I choose 'Dusty Morning' for the outside of the cabinet but I wanted the inside to be nice and bright so I used the 'Cushion White' for that. I have to say I am in love with the Dusty Morning. It's just a whisper of gray, not too dark and just perfect.. This photo taken with the cabinet next to white painted doors shows you just how subtle that gray is. For the stenciled pattern on the back of the cabinet I used Johnstones Cushion White plus Johnstone's Gold Metallic Paint from the revive range. 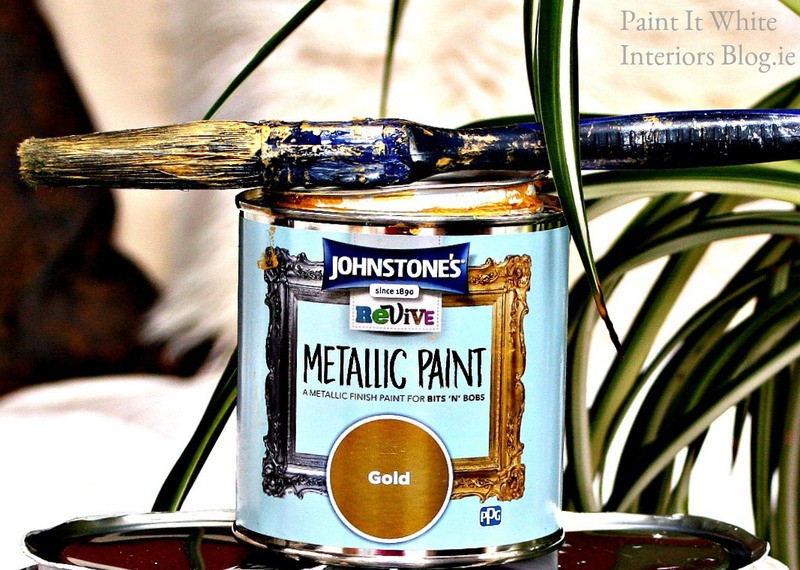 The Metallic Gold is not a chalky paint so you do need to prime your surface first if you are painting over laminate or any non pourous surface.This just means that you need to paint the surface first with one coat of Chalky Paint so that the metallic gold will stick. The chalky paints have a sort of built in primer making it so that you can paint over virtually anything, wood metal plastic etc. For the stenciled pattern on the back of the cabinet I used the 'Hollywood Squares Stencil' size large from Royal Design Studio Stencils. 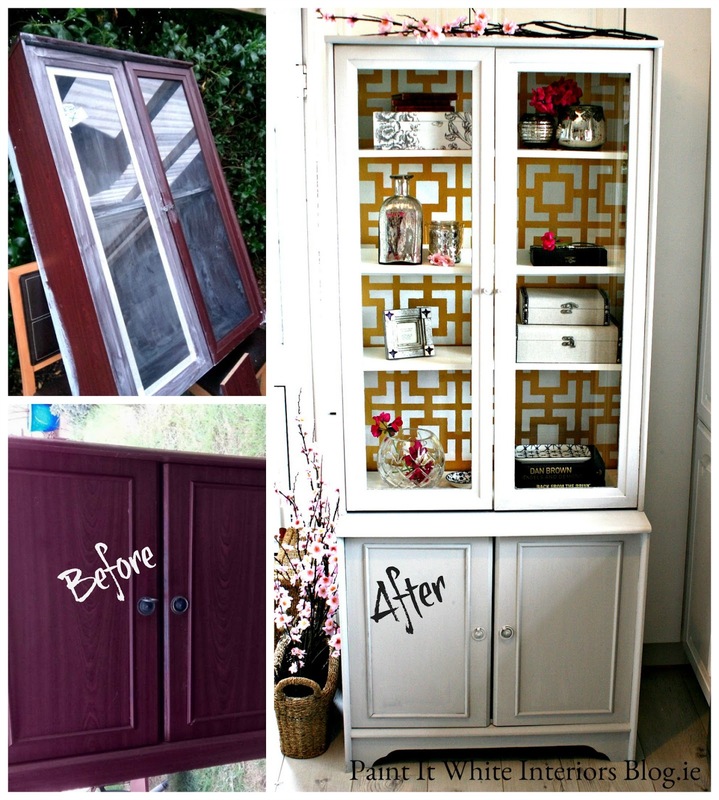 I painted the back of the cabinet gold all over first and then stenciled over that with the same Cushion White Paint that I used on the inside of the cabinet. Last of all I brushed on one coat of Johnstone's Revive Clear Wax all over this piece to protect it from any scratches. And that's it. I think I've covered everything but if you have any questions just ask away. Thank you so much that's very kind of you.